Seas T18RE/XFCTV H1144 is a high power Seas Co-axial unit similar to T18RE/XFCTV2 H1333. 6.5" XP cone and a 26mm tweeter giving full range response. A product datasheet/crossover can be downloaded from the Product Description page. Seas T18REX/CXFC H1144 is a high power Seas Co-axial unit similar to T18RE/XFCTV2 H1333. 6.5" XP cone and a 26mm tweeter giving full range response. FAMOUS COAXIAL UNIT. Gives excellent results. Frequency Response ( with suitable crossover, datasheet & design available below) 38Hz - 25,000 Hz. 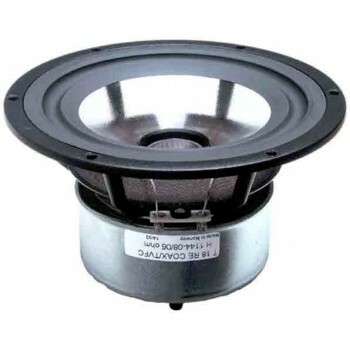 T18RE/XTVFC, is a coaxial arrangement of the SEAS 6.5" woofer with an XP cone and a precoated fabric dome high frequency unit, with a low resonance frequency. The cone of the woofer acts as a horn loading for the tweeter, and the chassis of the dome unit represents the throat of this horn. Unlike most traditional coaxial loudspeakers, this arrangement has two advantages: The two drive units have identical acoustic centers, and their directivities in the crossover frequency region are practically identical. Thus, it is possible to build a full range Hi Fi system with a symmetrical and stable radiation pattern combined with a smooth energy response. A compensation magnet and a shielding cup is mounted on the woofer magnet system to eliminate magnetic stray fields, hence the unit can be used very close to CRT`s in audio/video applications.